Information technology has empowered us with lot of knowledge and ability to do things easily. Mobile networks have transformed the way people network with each other. A revolution in social networking has not only connected people with their families and friends just at a click but has also brought businesses closer to their potential customers. Concetto Labs has been one of the pioneer companies developing Social Media Applications. Our custom-cut apps allow businesses and brands to engage with their customers with ease. Our social media app developers are well-versed with the cutting edge technologies and are passionate to deliver outstanding mobile networking apps. As a leading social media mobile app development company, we have created interactive social networking apps that aid businesses to reach their audience and engage with them for profitable relationships. Delivering award winning projects, we have built upscale social media apps for all businesses from small startups to top rated giant enterprises. Our suit of services fulfills all the requirements of users and enriches the user experience bridging the gaps for high returns. Enriched with knowledge about latest technologies, years of experience in the industry, and seasoned with huge experience, we have catered social app services to the clients worldwide making their businesses a part of their audiences social networks. Bringing technology and networking together, we develop game apps for a thrilling gaming experience for the audience to connect and enjoy. Our one stop social media hub app development brings all your social profiles on a single platform. Engage your employees, customers, staff members and partners on high-level for business growth with our expert corporate social media apps. We bring you customized facebook app development to improve your brand recognition, reach your target audience and announce big news. Our personalized social media LinkedIn App solutions help you emerge as a business giant. Know your user response, habits of prospective audiences, and feedback from customers with our custom-made twitter app. We craft result-oriented sweepstakes apps for getting highly interactive and loyal customers to promote your brand through word of mouth. Powered with latest tools and techniques, Concetto Labs has offered a new genre of mobile dating apps for building lifelong relations. Why is Concetto Labs your perfect Social Media App Development Partner? We bring you innovative apps for smart interactions with the users to increase user engagement. We plan, set priorities, allocate dedicated app developers, and leverage cutting-edge technologies for result-oriented solutions. We strictly follow quality driven process policy to deliver effective solutions before schedule to upscale your ROI graph. Our 1000+ loyal customers worldwide talk about our efficient, consistent and real-time after sales support. Q. Why build a social media application? 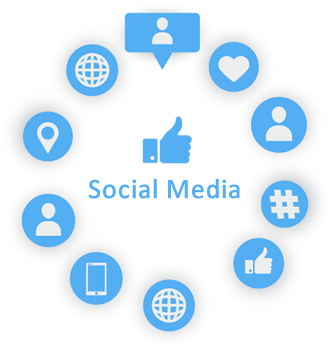 The power of social networks allows business carry on two-way communications reaching target audience promoting their brand and improving their services. This makes social media app the most viable tool for business growth. Q. Can you build social media app for both iOS and android? Yes, most apps that we build support both platforms iOS and android. We usually build apps that work across web and mobile devices. So, we use development technology that supports both platforms. Q. Can I hire social media app developer? We provide hire social media app developer services as per the client requirement. If you are interested in hiring full time developer, you can contact us. Q. How can I retain my social media app users? Our social media app comes inbuilt with push notifications. Our push notifications inform customers about latest networks, new groups, events, happenings, offers and deals. Q. How do I begin project with you?